Girls Wear Blue Too: A babble about bottles. Last week I had a little bit of a melt down when the boys's water bottle did not come home from Day care, not only did it not come home but it was 'gone' for a week. They couldn't find it. I had a whine about it, to the girls on line at the Scrap Pile Cyber Crop on Friday night. The reason I was so upset was because it is a Sigg bottle. If you follow the link and read the tabs to the left you will see why we choose these bottles. An expensive bottle, clearly labelled with his name in two places. How could it vanish for a week? when we got it back it was scratched and dinged in various places, this nagged at me too, not because it was damaged as such but because we didn't know how this happened. I know they get dinged, Miss fell over with hers the very first day we had them, we are not wanting them as status symbols that look pretty. We chose them because they are in our minds the best non plastic option we can have. A ding, flat spot or dent will not affect the bottle or its interior lining. Another feature of great appeal to me when choosing earlier this year is the interchangeable and take apart washable tops. They all came with the screw top that has the hole in it as on the green bottle, I find this handy as when I'm walking I simply hook it through one finger and carry it easily. I swapped these out and bought kid tops for the kids, and mud caps for them too, though we have since taken my boy's mud cap off as he can open it easier by himself, without the cap. I have taken one of the tops here apart to show how the pieces separate for washing, the seal can come out too. At home we each easily identify our own as we all have a different colour, but I am forced to get creative in the labelling as at Day care it seems they are unable to read the large stickers spelling out his name on the lower section that you can see in the dings photos above. I actually took a concept from Miss's preschool, after pondering it for a while, I don't have anything laminating equipment so had to put my thinking cap on for how to do it. The answer appeared in my recycling. You could make this much prettier or neater, but again I am after function over form here so was not fussy. 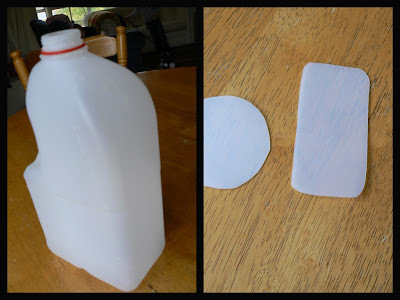 I took an empty 3l milk bottle and cut out and washed its mid section, then hand cut a tag shape from it, stamped a hero arts giraffe on the back using Staz on ink, wrote his name on the front with a laundry marker, made a hole in it and tied it on with some cotton rope/twine. the staz on will fade with time and lots of washing, the laundry marker seems to be staying put, the rope can get wet and replaced if it deteriorates. I wanted it to stay put. I think these could make great cheap bag tags too. So for you girls who read this and were wondering what I was on about, aside from concerns about attention levels at Day care, I hope this has given you some info about the product and why we chose it. I do think they are worth the money and will buy them again. Great idea with the tag, Tammy! Will have to check them out. Hey, does DS have trouble twisting the lid open? The ones I saw today were pretty hard to twist and I was worried Miss 2 might have trouble opening it? Yeah I know what you meant and why you had one T.Those plastic bottles are so very full of nasties.I am sorry that it cam back all dinged up and not looked after.I don't blame you having a melt down either.I would have been the same.Love the idea of the tag too. Ah, good idea! Will keep a look out now for a bargain I think :) Thanks Tammy! 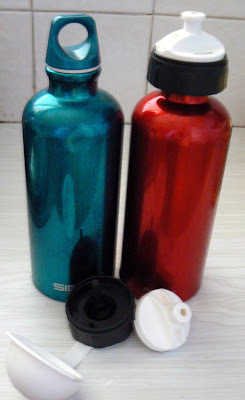 I bought two metal drink bottles for carrying water around, and I think they are wonderful. The plastic bottles turn the water warm really quickly, and makes the water taste unpleasant. I did read somewhere recently that if you can taste plastic, you are ingesting it ... Yuck.